There is little doubt that overall, hams have dumbed down as technology has raced ahead. An interesting result of this is the appearance of new antenna analysers aimed at the dumb ham. What is the dumb ham in this context? It seems that fewer and few hams understand the basic concept of impedance, ie the combination of resistance and reactance in quadrature, and notably that reactance is a signed quantity. The MFJ-259B became the ubiquitous antenna analyser more than a decade ago. It was a great tool, but in my opinion its greatest failing was a fundamental failure to sense the sign of the reactance component of impedance. This rolled up into other problems, and eventually the fraudulent claim that it measures reactance and impedance when in fact it measures ONLY the magnitude of reactance (not the sign reactance), the magnitude of impedance and magnitude of phase of impedance (not the sign of phase). The significance is that it is practitioners with lesser knowledge who MOST need the instrument to directly display the sign of reactance. The dumb ham is one who buys the ‘simpler’ instrument because it does not challenge their limited understanding of impedance, or stimulate development of their knowledge. The rest of this post is a direct quote of an article “In pursuit of dipole resonance with an MFJ259B” from VK1OD.net that I wrote in 2010, and which becomes more relevant with the increasing attraction to dumb antenna analysers. The text may contain links to articles that are no longer online. Hams often seek help trying to ‘resonate’ an antenna system using an MFJ259B or the like at the transmitter end of a feed line. Lets take an example of a half wave dipole for 40m, 10m above average ground, fed in the centre with a length of coax and an effective balun. An NEC model gives a set of feed point impedances over the range 6.9MHz to 7.3MHz. 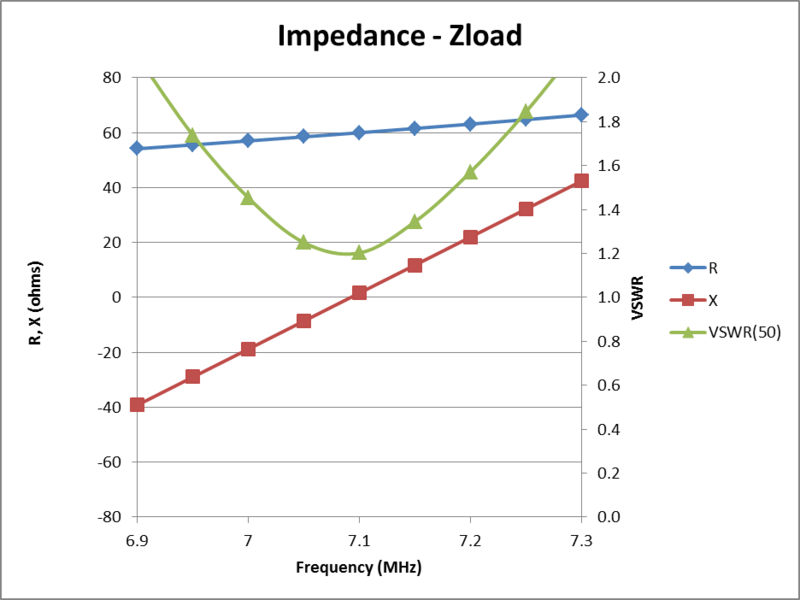 Fig 1 shows the feed point impedance R and X values from the NEC model, and the calculated VSWR(50). Theses are the values you would expect to measure with an MFJ259B or the like at the feed point. VSWR is minimum at about the same frequency where X=0. 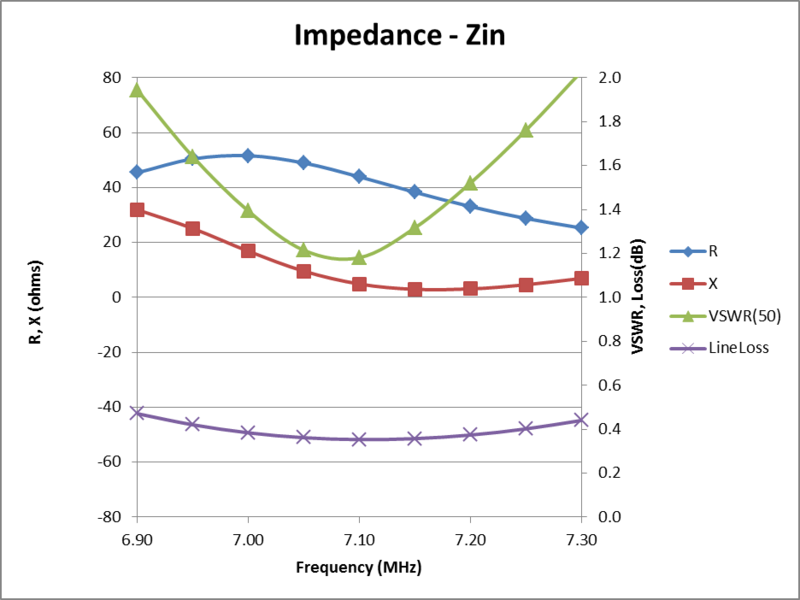 Fig 2 shows the impedance, VSWR(50) and line loss looking into 23m of RG213 feeding the same dipole. Starting with VSWR, it is almost identical to that in Fig 1. In fact, it is very slightly lower, as accounted for by the attenuation in the length of RG213. R and X are different, most notably X, and note that X never passes through zero. A trap many users fall into with an MFJ259B (or the like) that does not show the sign of X, watching X decrease as frequency increases, in this case to about 3Ω, and then increases again, that interpret it to have been negative at the lower frequencies, and passed through zero to positive values at the higher frequencies, and that the failure to show a true X=0 was just due to instrument error. Is the dipole resonant where the X value was minimum? No, X was tantalisingly small at 7.2MHz, but resonance was and is at 7.1MHz. It is wrong to interpret a minimum in X as proof of resonance. In the above scenario, the frequency of resonance is actually very close to that of lowest VSWR, but arguably lowest VSWR should be the optimisation target. Yes, a good VSWR meter is as good, and probably a better instrument (in that it is less likely to be disrupted by other sources of energy) for adjusting the dipole to resonant length. The MFJ259B has the advantage that it is a self contained source, and can be used outside the amateur bands. 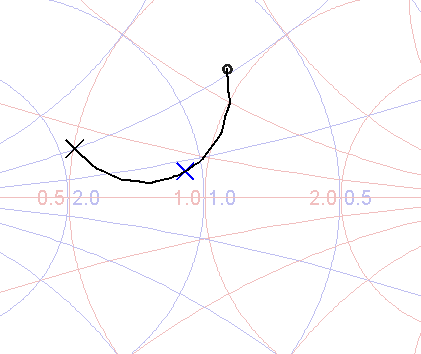 Dipole resonance is not necessarily exactly the point of minimum of minimum VSWR, but because for this type of antenna, X changes much more with frequency than R, the point of minimum VSWR is very close to resonance (X=0) at the feed point and in most cases indistinguishable with typical instruments. Transmission line loss is lowest in this scenario where VSWR is lowest, and if the dipole length is adjusted for lowest VSWR on the preferred frequency, the antenna system is optimised. In other cases, X might reach a minimum that is not close to zero, and that might be interpreted as evidence that the dipole is not resonant in the measured range. In some cases, X might pass through zero at two frequencies near the dipole resonant frequency. The effects described depend on the length of the transmission line. Some lengths of transmission line will cause reactance to smoothly increase to zero and continue increasing to positive values, but the frequency at which zero reactance occurs at the input to an arbitrary length of feedline under standing waves is not necessarily that at which the dipole is resonant. Understanding transmission lines is important to effective use of an MFJ259B or the like. The article The importance (or not) of being resonant is a perspective on whether resonance should be a goal anyway. Some analysers (eg the MFJ-259B) do not display the sign of X, just its magnitude. Lets include another case of impedance looking into a transmission line for the example dipole. 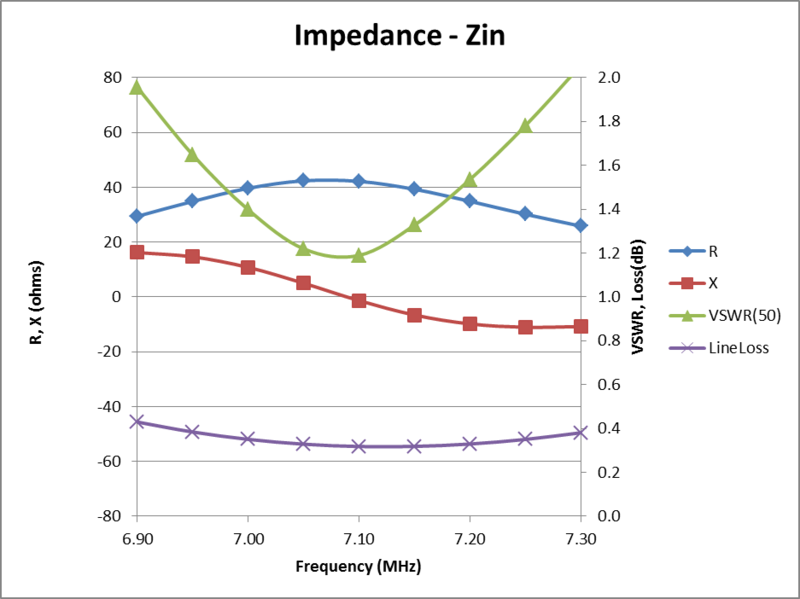 Fig 3 shows the impedance, VSWR(50) and line loss looking into 21m of RG213 feeding the same dipole. if R increases with frequency then X increases with frequency, else (R decreases with frequency,) X decreases. The generator output voltage is measured, as is the voltage across the series resistor (the current) and the voltage across the load. This data is sufficient to allow calculation of the load resistance and the MAGNITUDE (but not sign) of the series load reactance. It leaves the question as to how to determine whether the series load reactance is capacitive or inductive. To answer that, the user simply changes the frequency slightly. If the magnitude of the series reactance increases as the frequency is moved upwards, then the series reactance is an inductor. And vice versa for a capacitor. 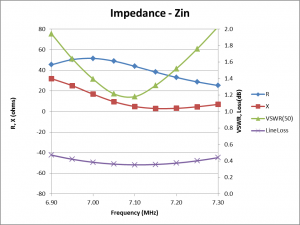 If frequency is increased and reactance (X on the display or Impedance on the meter) decreases, the load is capacitive at the measurement frequency. 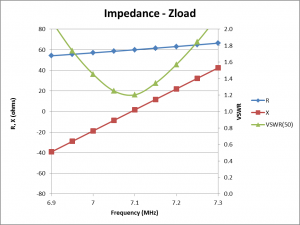 If frequency is reduced and reactance decreases, the load is inductive at the measurement frequency. The MFJ-269 can not determine if the reactance is actually inductive or capacitive. You can usually determine the type of reactance by adjusting frequency. 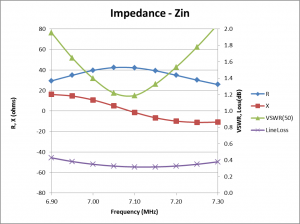 If frequency is increased and reactance (X on the display or Impedance on the meter) decreases, the load is capacitive at the measurement frequency. If frequency is reduced and reactance decreases, the load is inductive at the measurement frequency. This does NOT apply to antennas and also to other loads when they viewed through a transmission line more than a small fraction of a wavelength long. Note: The LP-100A cannot determine the sign of X automatically. If you QSY up from your current frequency, and the reactance goes up, then the reactance is inductive (sign is “+”), and conversely if it goes down, then the reactance is capacitive (sign is “-“). A suitable distance is QSY is about 100 kHz or more. The LP-Plot program has the ability to determine sign automatically, since it can control your transmitter’s frequency. When it plots a range of frequencies, it uses the slope of the reactance curve to determine sign, and plots the results accordingly. 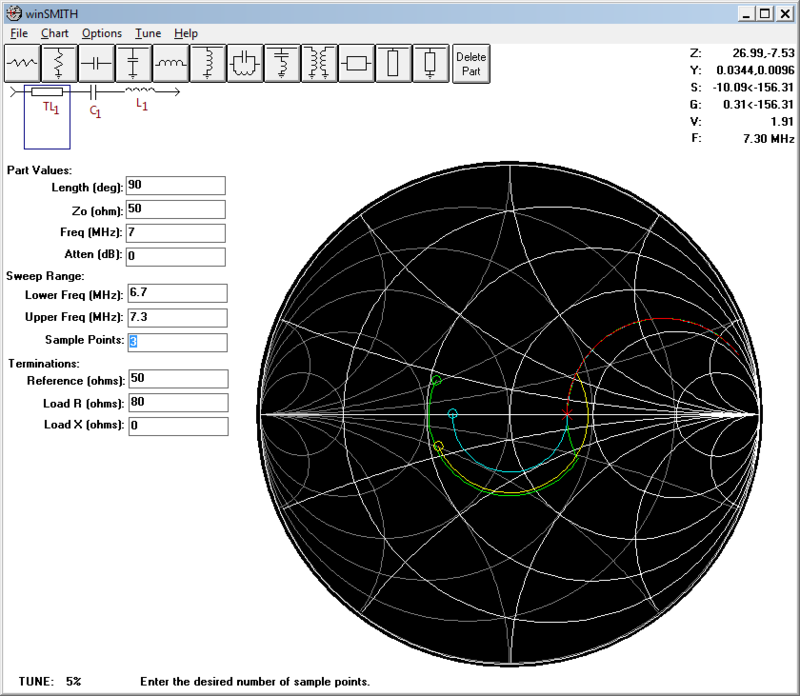 The “Phase” option looks for places where the Phase angle approaches 0 or 180 degrees and then does further processing to determine the correct sign for X. This option works in most cases and is the one you should try first. The “Rotation” option works on the principal that the Smith chart trace should always rotate in a clockwise direction as the frequency increases. This option works even if the Phase angle does not approach 0 or 180 degrees but does not handle cases where the Smith trace has “closed loops” that are not centered on the middle of the chart, as at left. The trick I use, and it is one that will work with almost any analyzer, is to slightly shift the frequency and see what happens to the value of the reactance. If an increase in frequency results in an increase in reactance, then the reactance is inductive, if it goes down its capacitive. The ZPLOTS claim that its ‘rotation’ algorithm doesn’t work in some cases suggests that it treats the locus of reflection coefficient as an arc about the chart centre, and it is correct that it is not necessarily a clockwise arc about the chart centre. That does not mean that the local form of a locus might not be a clockwise arc about some other centre that might even be between the arc and the outside of the chart, indeed this occurs quite commonly (though it seems ZPLOTS does not handle it). Only the MFJ-269 description is accurate, though it elsewhere makes the claim [t]he IMPEDANCE meter displays the complex impedance which is plainly false by their own statement quoted above. The MFJ-269 displays resistance R and magnitude of reactance |X|, but not the sign of reactance so since it does not display reactance X, it does not display the complex impedance. Algorithm 1 would correctly sign X in Fig 1, but incorrectly in the case of Fig 2 and Fig 3. Algorithm 2 would correctly sign X in Fig 1 and Fig 3, but incorrectly in the case of Fig 2. Although algorithm 2 is more complicated, and solves some problems with algorithm 1, it fails on some cases that algorithm 1 handles correctly. Neither of these two algorithms apply generally, they may apply to some specific load types, but whilst both algorithms apply at the dipole feed point, neither applies looking into an arbitrary length of feed line. 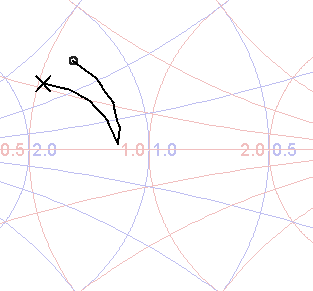 Fig 4 shows the locus of R,|X| from Fig 2 plotted on a Smith chart, the reflection coefficient curve. The black ‘o’ is the low frequency end, the black X is at the high frequency end. As frequency increases, the point curves clockwise (though not necessarily about the chart centre), which is correct. If X was plotted as negative, the point curves anticlockwise with increasing frequency which is wrong (passive networks do not behave that way), so all X are positive. 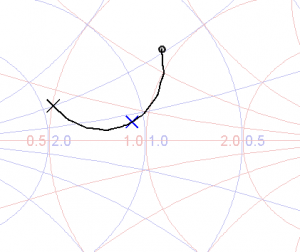 Plotting measured points on a Smith chart can be a good visualisation for working out which points were negative X because with increasing frequency, the points curve clockwise, even if that does not involve crossing the X=0 axis. Fig 5 shows the locus of R,|X| for the case in Fig 3. Again the rule is that the points curve clockwise with increasing frequency, so the arc from the low frequency end (‘o’) almost to the X=0 axis is correct, and the next arc section needs its X values made negative (ie mirrored under the X=0 axis) to continue the clockwise curve. Try this quick quiz. I have three measurements in the following table, are any of the X values negative, which ones. Answer at the end. When MFJ say MFJ-259B gives you a complete pictures of your antennas performance. You can read antenna SWR and Complex Impedance 1.8 to 170MHz Read Complex Impedance as series resistance and reactance (R+jX) or as magnitude (Z) and phase (degrees) do they misrepresent the instrument when it actually correctly indicates complex impedance ONLY when X is positive, indicates X correctly ONLY when X is positive, indicates magnitude of Z rather than Z, and the indicates phase of Z correctly only where X is positive. Its shortcoming is essentially to not correctly indicate the sign of X and the sign of phase on loads with negative X. Nevertheless, as shown above, the sign of X can be deduced from a suitable set of measurements, though it is not necessarily trivial. Fortunately though, and as discussed earlier, the optimisation for many antennas should be minimum VSWR, the frequency of which is indicated reliably, even looking through a length of transmission line. Fig 6 shows the problem. It is a series tuned circuit resonant at 7MHz, a series R of 80Ω, and a length of 50Ω line (90° at 7MHz). If it seems a contrived configuration, it behaves very much like a half wave dipole with a quarter wave feed line. Most users of an MFJ259B or the like would incorrectly assume that it is the lower frequency case that is capacitive. Maguire, D. nd. Zplots Appendix 3 Resolving the Sign of X. http://www.ac6la.com/zpapndx3.html (accessed 10/02/2013). Hallas, Joel. 2013. The doctor is in In QST Sep 2013. Telepost Inc June 2012. LP-100A Digital vector RF wattmeter operations manual. http://www.telepostinc.com/LP-100A-Op_Manual.pdf (accessed 16/09/13).